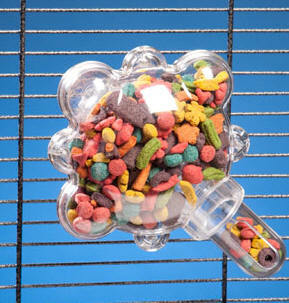 Constructed of Clear, Polycarbonate Plastic this forager makes your parrot think! Your bird spins to figure out that treats come down through the tube. Your parrot spins toy to make treats fall into transparent tube at bottom. You can adjust tube at bottom of tumbler to make it easier or more difficult for your bird, so once your bird figures things out, you can change it up and keep him guessing. Attaches to side of cage. Also, check out the Capsule, Wheel, Generation II Wheels, Carousel, Push & Pull, Paddle Wheel, Foraging Ball & Kabob, and See Saw foragers! 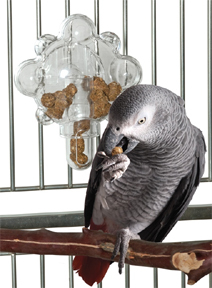 The Food Tumbler arrives empty and ready for you to fill with your parrots favorite goodies. Offer only dry, healthy treat foods in these feeders, empty them often to avoid spoilage! You can wash all acrylics in one part bleach, 3-4 parts water, rinse thoroughly and air dry!